Traditionally, businesses have had to buy and install servers and storage to run on-premises applications. With TechHeights Hosted Application offering, SMBs can now use business applications that are hosted in the cloud. This enables businesses to bring down the operational costs and enjoy fully managed hosted applications. TechHeights has partnered with Amazon to provide cloud managed desktop services. The hosted desktop service allows you to access your applications and documents on your Windows or Mac devices. This solution is perfect for SMBs that require anytime, anywhere access to their desktops, documents and applications. Our hybrid cloud enables you to securely extend your datacenter and applications to the cloud. This solution allows you to place intended workloads in the cloud while keeping the rest on-premise. This option provides cost savings and flexibility of moving applications between your on-premise datacenter or private cloud, to the public cloud. TechHeights is an IT consulting company that is agnostic of clouding infrastructure hosting platforms. We have partnered with Microsoft, VMware and Amazon to help the businesses identify the solution that best fits the client’s requirements. I cannot be more thankful that I was introduced to Techheights. Between the server setup and office configurations that were needed to be done I was completely overwhelmed. I cannot stress enough how helpful, professional and knowledgeable these guys are. They assisted me in the office as well as from offsite even at odd and weekend hours. They are and always will remain on my speed dial! Thanks again!! We needed a Cisco engineer to get our router configured so that our new office would have VoIP service and internet. I came across TechHeights in a pinch and Shuchipan answered my distress call. They came to our office the same day, we set up remote access to the router, and their engineers found the problem and fixed it the same day. Communication was super friendly and fast, and Shuchipan made sure our router was working before the day was out. Super company that I highly recommend for IT services. When we first contacted Shuchipan at Techheights, our main server was failing. Shuchipan scheduled an appointment the following day and thoroughly analyzed our system to determine our issues. Despite efforts to repair the system, Shuchipan quickly advised us that it would be more cost-effective to replace the hardware. In the following days, TechHeights sourced an affordable new machine, installed the O/S, reconfigured the system, restored our backup, and got us back on our feet with zero data-loss The system has been working perfectly ever since, and he saved us thousands of dollar of potentially unsuccessful repair efforts on the old machine and additional down time. Shuchipan and his team is extremely easy to work with – they have deep IT knowledge, understands issues quickly, is an objective and logical problem solver, and generously shares his knowledge. I would recommend TechHeights highly to anyone. TechHeights quickly came up with solutions for our small business and were very helpful with all my questions. They came to us and worked quickly to get the server, office 365, firewall and our network setup. We still use them for all our IT needs. our migration service includes a benchmark migration to prove our the timing, migration process and network and storage connectivity. 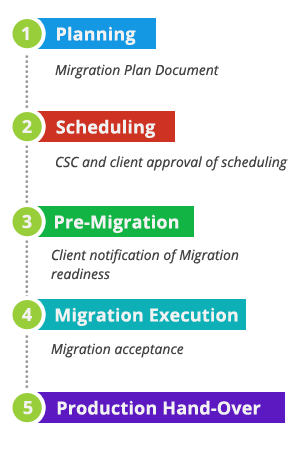 it also includes a pilot migration on a predefined application set that validates the migration. We are experienced in designing and implementing Cloud Infrastructure, Cloud Email Migration, Cloud Servers, Cloud Disaster Recovery and Business Continuity.